More UK jobs at Nissan | What Car? 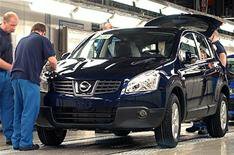 Scrappage schemes have created more UK jobs at Nissan's factory in Sunderland. An extra 100 workers will be employed to meet demand created by scrappage schemes across Europe. The new jobs will initially be in the form of three-month contracts, and are in addition to the 250 temporary posts Nissan created during May and June. Nissan says that scrappage schemes have boosted demand for models built at the Sunderland factory by 24,000 cars, compared with the original production plan for the June-September period. Trevor Mann, Nissan's senior vice president for manufacturing, Europe said: 'We are currently experiencing a short-term, but significant, spike in demand for models built at Sunderland as a result of scrappage incentive schemes. The Micra, Note, Qashqai and Qashqai +2 are all built at the Sunderland factory. The standard scrappage scheme applies to every Nissan model, but Nissan is also offering a 2000 discount for buyers trading in cars between eight and 10 years old if they buy a new Nissan that has been built in the UK. The best-selling Nissan during June was the Micra, although sales of the Qashqai and Qashqai +2 combined accounted for just over a third of sales.